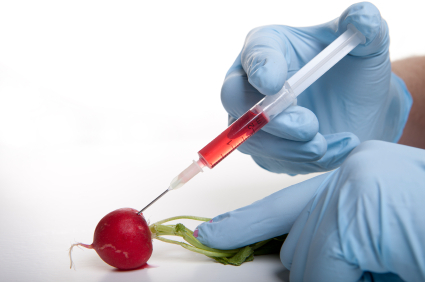 Genetically Engineered Food Alters Our Digestive Systems! There are no human clinical trials of genetically engineered foods. The only published human feeding experiment revealed that genetic material inserted into GE soy transfers into the DNA of bacteria living inside our intestines and continues to function. Even after we stop eating GE foods, we may still have the GE proteins produced continuously inside us. As the Institute for Responsible Technology has noted, the genetic engineering process creates massive collateral damage, causing mutations in hundreds or thousands of locations throughout the plant’s DNA. Natural genes can be deleted or permanently turned on or off, and hundreds may change their behavior. Even the inserted gene can be damaged or rearranged, and may create proteins that can trigger allergies or promote disease. If the antibiotic gene inserted into most GM crops were to transfer, it could create antibiotic-resistant diseases. Bt toxins (Bacillus thuringiensis) inserted into GM food crops to kill pests are reaching the bloodstreams of 93% of women and 80% of unborn babies because of the consumption of meat, milk, and eggs from livestock fed GE corn. This could turn bacteria in our intestines into pesticide factories. And we’ve seen cross-species transfer of DNA happen before. A significant percentage of human DNA is actually viral DNA that became part of us over 40 million years ago. There is concern that virally transmitted DNA may cause mutations and psychiatric disorders such as schizophrenia and mood disorders. GE organisms may exacerbate this phenomenon. Leaky gut syndrome happens when the intestinal lining becomes inflamed, and the microvilli on the lining become damaged; this prevents the microvilli from absorbing nutrients and producing necessary enzymes and secretions for healthy digestion and absorption. In between cells are desmosomes, which keep the cells together, forming a strong structure preventing large molecules from passing through. When an area becomes inflamed, the structure is weakened, allowing larger molecules to escape. The makes the immune system produce antibodies and cytokines to fight off molecules because they are perceived as antigens. Allergies have already skyrocketed in the US, and with the introduction of GE soy in the UK, soy related allergies rose to 50%. Yet federal agencies turn a blind eye to the dangers of genetic engineering. In 1989 there was a tragic outbreak of eosinophilia-myalgia syndrome (EMS), an incredibly painful disease. The outbreak was traced to consumption of l-tryptophan supplements produced by a Japanese company using genetically engineered bacteria. The bacteria are used to increase yields, but they increase impurities during the fermentation process—possibly leading to a level of contaminants that caused the EMS. To this day, the government has refused to address the issue of purity standards for GE-manufactured products. Instead, federal agencies and biotech companies claimed that contaminants linked to the EMS tragedy were caused by changes in the company’s manufacturing process—despite the fact that the company was precisely following the purity standards enforced by government rules. The effects of other genetically modified products may not be as obvious so quickly, but can be even more devastating; as we have reported previously, GMOs are causing terrible genetic changes in mammal offspring. Scientists are seeing birth defects, high infant mortality rates, and sterility in hamsters, rats, and livestock fed GMO soy and corn, and some hamster pups even begin growing hair inside their mouths. Recombinant DNA technology [genetic engineering]faces our society with problems unprecedented, not only in the history of science, but of life on the Earth….Now whole new proteins will be transposed overnight into wholly new associations, with consequences no one can foretell, either for the host organism or their neighbors….For going ahead in this direction may not only be unwise but dangerous. Potentially, it could breed new animal and plant diseases, new sources of cancer, novel epidemics. The USDA has released two Environmental Assessment reports, one for Monsanto’s corn genetically engineered to be drought-tolerant, and the other for Syngenta Biotechnology’s cotton genetically engineered to be pest-resistant. USDA believes the cotton is “unlikely to pose a plant pest risk”; for the corn, the agency is considering either keeping the corn under regulation, or assigning it nonregulated status (banning it altogether is off the table). The comment period for both EAs is open until July 11. Please take action today! Tell the USDA that the corn and cotton must not be deregulated—that without strict controls, GE crops will encroach on non-GE crops, contaminating them, including organic crops—which will, of course, render them non-organic. Please note that the comment period has now closed and this action alert is no longer available. George Wald, “The Case Against Genetic Engineering,” The Sciences, Sept./Oct. 1976.